On 29th September in the conference room of City hall in Skopje, under the IPA project “Support to access the right to protection personal data “of the Directorate for personal data protection, a joint workshop was held for the Promotion of the two human rights- free access to public information and the right to protection of personal data. Namely, it’s the realization of activity 8.1 of the IPA project registered in the Terms of Reference (ToR); regional workshops / public forums regarding the balance between the right to free access to public information and protection of personal data. In the addressing opening speech, the Director of the Directorate for Personal Data Protection, Mr. Goran Trajkovski said that the two basic human rights are recognized by the Constitution and laws in the country. “A potential conflict between these two rights often occurs when there is a request for access to personal data held by public authorities”, said among other things Mr.Trajkovski. According to him, there is no simple, single solution how to make balance between the two rights and how to make the appropriate decision. 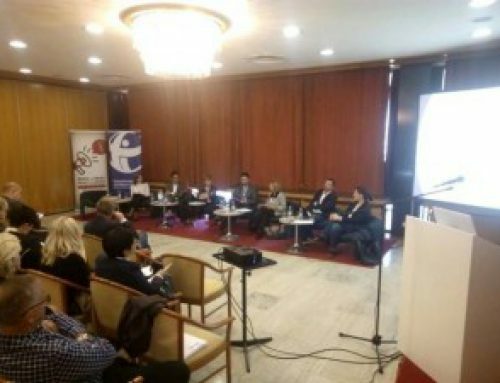 “In most cases, the problem can be mitigated by adoption of clear definitions in the system in terms of the legal legislation, clear guidelines, techniques and supervision,” emphasized Mr.Trajkovski. 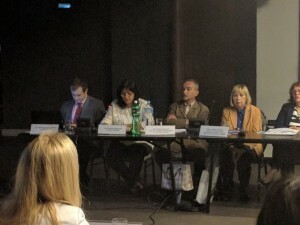 On behalf of the Commission for Protection of the Right to Free Access to Public Information, Valentina Fidanovska, Member of the Commission addressed the attendees. 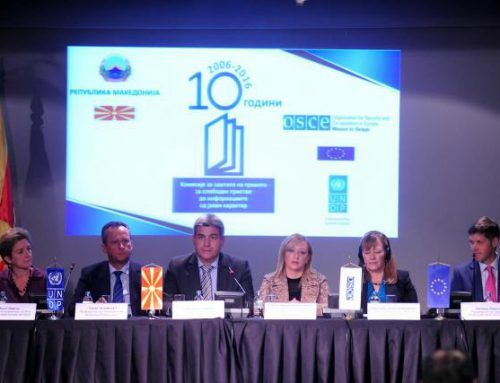 Mrs. Fidanovska stated that: “This project is of great importance to the Commission, since it offers a great opportunity for all of us to practically elaborate and to clarify several aspects, to evaluate the relationship between these two rights that are conditionally close but different. “The theme of the workshop is” Promoting both rights-the right to free access to public information and the right to protection of personal data “, which is an excellent opportunity through the exchange of experiences, opinions and presentation of cases from practice, to contribute to changing the general impression that the right to privacy and the right to free access to public information are set against each other ” emphasized Ms. Fidanovska. According to Ms. Fidanovska, there is no general solution for detecting the balance between these two rights since it is one of the most difficult constitutional and legal issues. Therefore, it should be applied on a case by case basis as an ongoing procedure to each case individually. “A great advantage of our law is that it does not provide absolute exemptions or exceptions that would avoid the test. This means that even document with the highest level of classification- “state secret”, are subject to review through the test of harmfulness “stressed Ms. Fidanovska. Presentations to the attendees were held by Mr. Peter Bazus, representative of the Hungarian National Office for Personal Data Protection and Freedom of Information, Mr.Jernej Rovsek -key expert in the legal field of the Project and former Deputy Ombudsman of the Republic of Slovenia. Both presenters transferred and shared their experiences with examples of undertaken actions concerning the two legally guaranteed rights in their countries. On the workshop both involved institutions presented the Macedonian experience and practices in the field of protection of free access to public information and personal data protection in the country of before 30 present invited guests/ attendees , representatives of the European Union, the Secretariat for European Affairs of the Republic of Macedonia and other meaningful institutions in the country. Presenters form DPDP were Manuela Ms.Stanoevska Stoilkovska and Ms.Marjana Planojevich, and from KOMSPI Mr. Cvetan Stanoeski and Ms. Jordanka Stojkova. Under the project activities two more regional workshops are planned to be organized in the country by the end of 2016 (for the western and eastern part of the country). For the next period it is planned to produce a universal joined Handbook for exercising both rights, as well as a realization of five training sessions / workshops dedicated to the promotion of the Handbook and presentation of both human rights.